This week has seen work on all three of my projects, I’ve definitely not had the chance to get bored! The mermaid tail has had a few more inches added, and it’s been measured up against my son (who is the same age as his cousin). It looks like it’s half as long as it needs to be, it just needs a few long sessions to get it to the right length before I work on the shaping. I’ve managed 4 more rows on the cosy stripe too; it’s a perfect project for after days at the allotment as it’s so simple. It’s not my ‘priority’ project, although my 5 year old knows it’s for him and regularly asks for updates. He’s quite a demanding boss! Notice a theme to the photos? 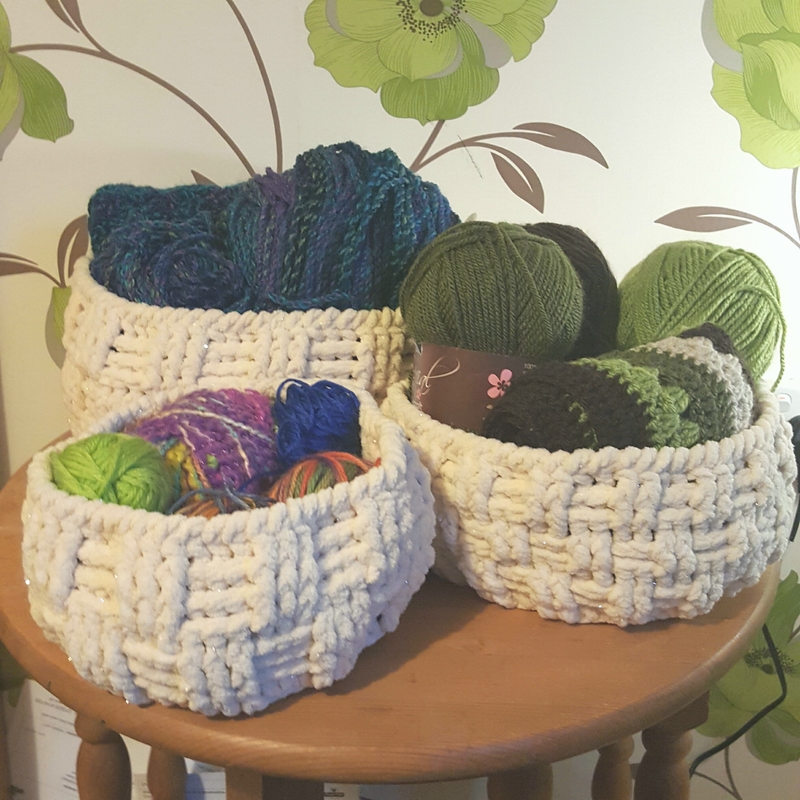 I’ve finished the set of three baskets I was designing. They’ll have their own post next week (hopefully) with a tutorial. 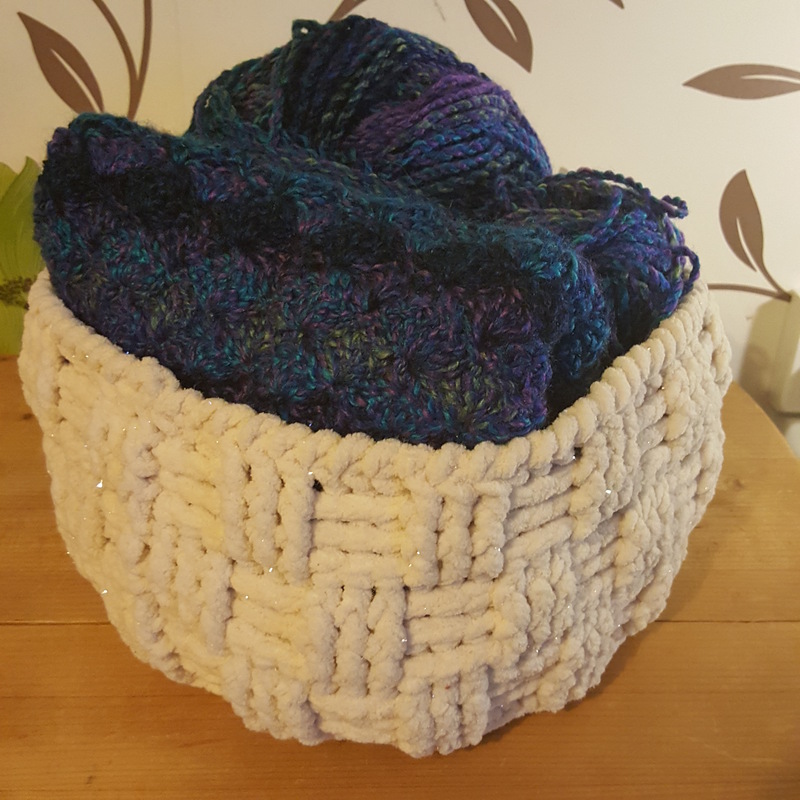 They seem to make quite handy WIP baskets, but I can see many uses for them around the house! I absolutely love the basket weave pattern, the texture is fantastic, so touchable! I’m on a mission to try and get a good amount finished on at least one project this week, as I’ve got a few others I want to start but I don’t want to start anything else until I’ve finished one. What are you working on this week? How’s it going? Share a link to your blog or Instagram if you like so I can see. Have a craft filled week! The finished baskets look fab. Very chic! I would love to be able to make something like them. But, I am now looking for another dog blanket or scarf. So squares and rectangles, basically! Lol! Never considered that aspect! I’m getting better at refereeing these days! Lol…👼👼bet they’re little angels really! They are at this time of night! Ha ha! Yes my son is tucked up in bed too, early start for college. The cats on the other hand are throwing catnip mousies about and thundering up and downstairs…! Lol! I miss that from when we had our first cat, he was bonkers. Thank you, please do add your link 😊 I shall keep an eye out anyway. Thanks! They have so many great colour combinations! They do, I could look at them all day! I am doing some clothes sewing for me. I haven’t done any sewing for myself for a long time so I hope the results are worthwhile. Have fun! What are you making? I am making a simple top and then a more complicated shirt dress. I have just finished a very loose top, I made it from an old pattern where the sizes were a very floppy fit! I will be posting about them later. Nice baskets! 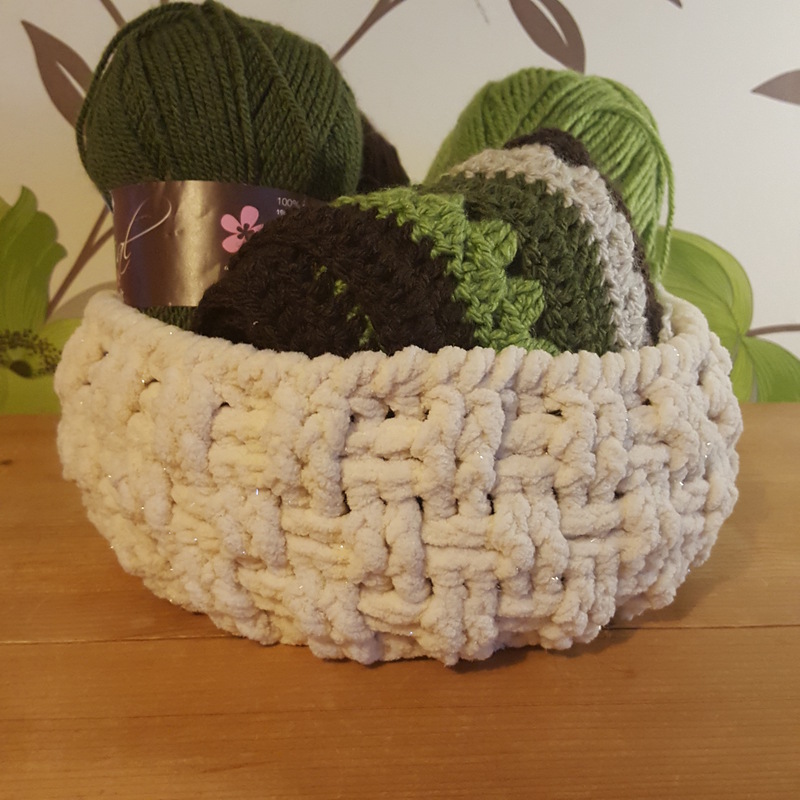 I’ve been using some crochet baskets to store my yarn in instead of my wips and it works great too! I like that idea, Mr C would rather it was hidden lol. I may have one basket of display yarn! Everytime you mention them baskets I’m like yaaaaaas. The basket weave is such a cool stitch, never done it but looks awesome especially with baskets lol! Got some scrap yarn so might double up and make some once your pattern is out! – Also working on C2C it’s decreasing but it seems soooooooo long. I have wrote in my diary thing what to crochet each day to give me a boost lol! Thank you! Good idea to keep a record and plan. I had been trying to do a little bit on each project but I like to feel as if I’ve made progress so only work on one each evening now. what an attractive way to store your work! Thank you, it helps remind me which things need more work doing on them! Hehe at the housework tips! It really is a squeeze to get it all done some days. You’re pretty busy with your WIPs! 😊 I’m planning a knitting project next, I just don’t know what! I do love those baskets, can’t wait for the pattern. Today I’m frantically recalculating a chevron blanket that I started at the weekend. I thought I’d got it all figured out, but then got halfway through my second colour stripe and realised I was almost out of yarn. So annoying!!! I think I’ve got the amounts worked out now, but it’s not going to look at all how I imagined. We live and learn, I spose. Your projects sound really fun! I bet the wizard hat will be much loved. I’ve never made clothes for me, I just don’t think I’d be brave enough to wear them. Oooh the baskets awe so sweet! I love them! Cant wait for the pattern! Thank you, I’ve not seen those. Is it a US store? 😂😂 now I’ve shown my true ‘dim’ colours. Those baskets are beautiful. They’re not quite what I imagined the first time you posted the base. Next to the start of the mermaid blanket, they reminded me of sea shells, which I may run with after the pattern is posted! Currently, I’m still trying to finish up a shawl and scarf (though no matter how many hours go into them, they don’t look like they’re getting any longer), and I just finished my owl bag. 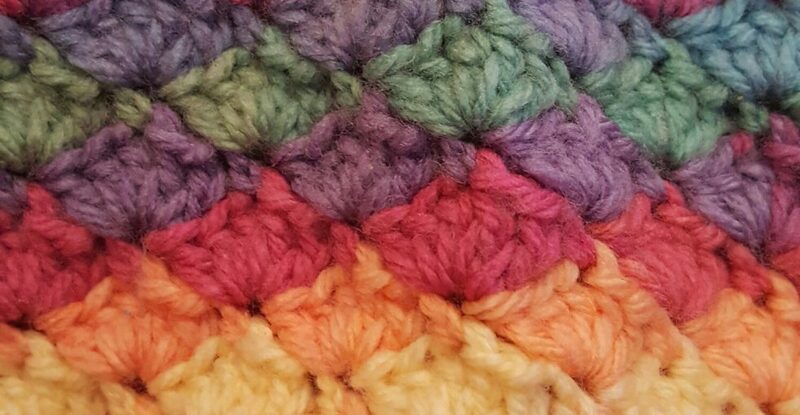 I’m hoping to post a crocodile stitch in the round tutorial tomorrow and the owl bag pattern next week! Those baskets look amazing.. I have done a weave pattern in knitting but these look so good Mrs C.. Brilliant..Work.. Absolutely love those baskets! They look so cute and handy too! What am I working on? Everything! This week I’ve been rotating through most of my WIPS during the day during “dead” times when I’m not teaching. Except the afghans. I love the baskets. I actually have the right yarn to make them and I agree, I can visualize lots of uses for them around the house. I’ve actually been thinking about making a container to store potatoes and another for onions and your baskets would be perfect for that. Back home we had a “root cellar” for that but my current expat apartment life does not allow for such cool, dark places. Also, they’d be handy for harvesting from the allotment, wouldn’t they? Just add straps for easy carrying. By the way, looks like you’re WIPping it good!